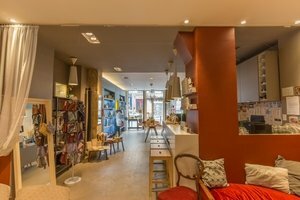 This boutique in the bustling area of Saint Georges close to Notre Dame de Lorette is perfect for Pop-Up Shops and creative Retail Events. The space has a classic shop frontage with large display windows framed in an elegant navy blue. Inside the space has a contemporary feel with printed wallpaper, brightly coloured walls and a modular layout. There is a range of product display furniture that is both modern and industrial chic which adds character to the space. 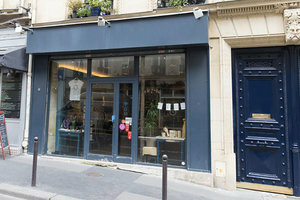 Advantageously located close to Rue des Martyrs on a busy street, this shop benefits from good foot traffic and is ideal for trendy and creative brands looking for a unique shop space that is well-equipped for a range of retail types.